The Police Academy will move from its longtime Gramercy home to a new Queens campus. GRAMERCY — The Police Academy is leaving its longtime Gramercy home for good in July, the NYPD said this week. After years of planning and construction, the Police Academy will move from East 20th Street to a new 30-acre campus in College Point, Queens, which is nearing completion, an NYPD spokesman said. “Currently, the first recruit class remains scheduled to enter the new facility in July,” the spokesman said in an email, declining to comment further. The NYPD has yet to say what will happen to the Police Academy's building at 235 E. 20th St., near Third Avenue, once it's empty. The Department of Citywide Administrative Services, which manages the city's properties, referred questions to the NYPD. Community Board 6 has been advocating since 2008 for the eight-story building to become a school, since it already has classrooms, a gym, locker rooms, an assembly area, a library and a lecture room. But while the Department of Education acknowledged that the agency was aware of the space opening up, a DOE spokesman said there were no plans to convert the academy to a school. 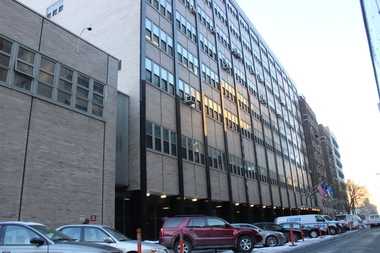 One potential upside to the Police Academy's move is that it could free up parking along East 20th and East 21st streets between Second and Third avenues, where residents have complained that workers at the Police Academy were taking up all the spots. However, workers at nearby businesses said they were worried that the loss of the Police Academy would slow foot traffic in the area. "Forty-five percent of our business comes from the Police Academy," said George Rosas, who works at Il Forno Pizzeria, which is located across the street from the academy. "It's not just us, though — all the neighbors are going to feel different," Rosas continued. "I think it's a safety thing. When people are walking around, there are always groups of recruits at every corner. Now I think people are going to feel lonely."